In How I Beat Self Sabotage And How You Can Too, Erica Snyder shares her personal experience of going from living a life of alcoholism, depression and obesity, to living a life of sobriety, infectious happiness, and purpose as one of America’s most beloved fitness and wellness instructors. 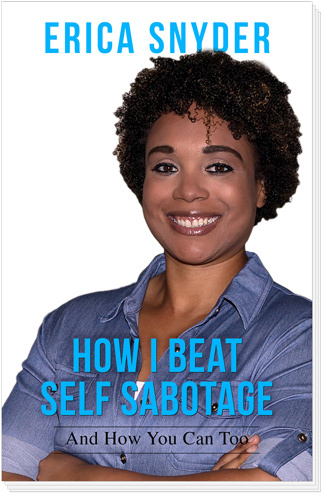 Having identified self sabotage as the root cause preventing her from reaching her goals and realizing her dreams, and frustrated with the lack of any practical information to effectively overcome it, Erica embarked on a mission to discover real world solutions for beating self sabotage. The result of a six year journey, How I Beat Self Sabotage And How You Can Too reveals what she discovered in a practical, relatable, and heart-felt way. This book will surely become a constant companion with you on your journey to beating self sabotage and to living the life you were meant to live. Available on Amazon, Nook, or at the iBookstore. Click on any icon below to preview and purchase. Or, receive your FREE copy when you buy any personal development mentoring package with Erica. Click here to Watch official book trailer!